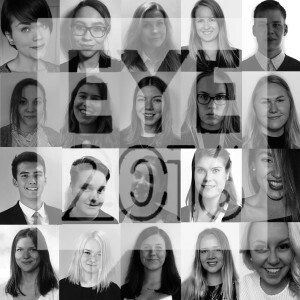 This May being the first time European Youth Parliament Finland sends a delegation to the European Youth Event, the visit offers a unique opportunity to cooperate with other youth organisations, challenge the itself and improve its international profile. Having been given the opportunity to have a workshop open to all participants, EYP Finland is in a key position to enhance its work as an educational organization globally. The delegation consists of 20 persons with very different backgrounds in the European Youth Parliament. In fact that was the aim when the group was being selected. As all members of the EYP, we all have started our journey as a delegate in the Regional Sessions from where we have made our ways to our different positions in the EYP. There are few of us who have just started in the EYP and have only been delegates. Some of us have also been journalists, organisers and chairpersons in sessions in Finland as well as abroad. In addition, our group has members from every Regional Committee of Finland and from the Board of EYP Finland. EYE offers our delegates a chance to meet working professionals of the European Union as well as over 7000 young Europeans from all over the continent. Some of us are perhaps interested in someday working at the European Parliament which adds to the excitement we share for the visit. However, our delegation is not only expecting to receive insight to future professions but also wishes to gain insight to European issues. Who knows, perhaps our two days at EYE will be the two days that inspire us in finding the solutions to the problems which we have earlier discussed at committee work? Visiting the EYE which will be held in Strasbourg in North-Eastern France has also sparked excitement over the hosting city and France itself. Some of us have visited France once or twice, a couple of us have even been exchange-students there, and some of us have never set foot in the country. Our delegation has varied connections to the country, may it be through engaging with the language, chatting with our EYP friends, enjoying the cuisine or embracing French design. However, even if it sounds like an EYP cliché, the one factor that unites each and everyone of us is the opportunity to visit the centre of Europe.